Choosing clothing to bleach from black to white involves a few steps prior to beginning the process. Not all fabrics bleach completely, and bleach can damage fabrics, ruining a garment long before it approaches a white color. With a little preparation and patience, you can take a black garment and turn it white. However, the fabric, dyes, and thread colors impact the thoroughness of the bleaching process. When experimenting first and then bleaching a garment, work in a well-ventilated area, avoid breathing the fumes and wear protective gloves. Look for the fabric content label on the garment. Cotton or cotton blends lend themselves to bleaching, although some types of cotton hang onto their colors steadfastly. If you want the garment to be 100 percent white, turn it inside out and use an eyedropper filled with a mixture of 2 tsp. 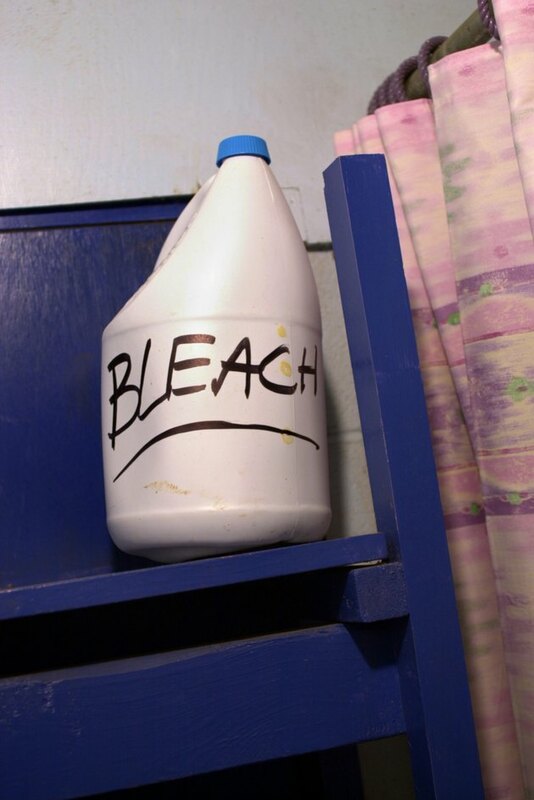 bleach to one-quarter cup water. Dribble the mixture on a seam, let it rest a minute, and check the seam and threads for fading. If the degree of white is acceptable to you, chances are that the entire garment will bleach successfully. Fill a plastic bucket or sink with water. Add one cup of bleach to the water and stir with a plastic or stainless steel spoon until it's evenly mixed. Do not use a wooden spoon because it absorbs the liquid. Place the clothing inside the sink and completely immerse it. If some of the garment drifts toward the top, put something heavy on top to weigh it down. A stainless steel pan with a glass or metal bowl inside can hold the clothing down. Set a timer or make a note to check the garment at 30-minute intervals. The less time the garment sits in the bleach-water mixture, the better it is for the fabric. Rinse the garment thoroughly with water. Inspect the garment for its overall whiteness. If it still has remaining black in it, repeat the bleaching process. Once you get the final color you want, rinse the garment again to remove all the bleach. Either hang to dry or use a dryer.